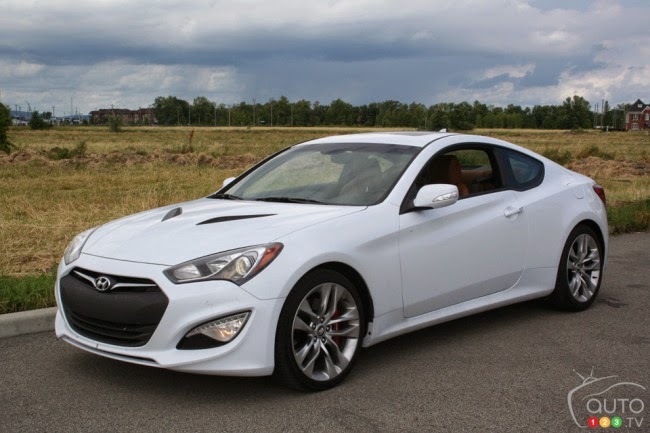 The Hyundai Genesis Coupe handles well, is comfortable, has impressive performance, is reasonably practical and comes with lots of equipment as standard. And when you consider it costs the same in the States as we pay here for a diesel hatchback, it would be one of the bargains of the decade if it made it to the UK at that price. While most of its range may be ‘Global’ cars, the Hyundai Genesis Coupe is one model the Korean firm hasn’t brought to the UK. But should it? To find out we took one on 1,000-mile road trip across California testing it on the six-lane highways out of LA, the sweeping routes through Yosemite National Park and the tight and twisty coastal passes of Big Sur. Now in it’s fifth year, the Hyundai Genesis Coupe has received an overhaul to keep it competitive against the Nissan 370Z and Toyota GT 86 (known as the Scion FR-S in the US). The Hyundai Genesis Coupe starts from just under $27,000 - after converting to Sterling and adding VAT, this is around £20,000. That's about the same you will pay here for a Hyundai i30 1.6 CRDi Sport, but instead of a diesel hatchback you get a well-equipped rear-drive sports coupe with a 3.8-litre V6. Despite the large capacity you do need to rev the V6 to get the best out of it – thankfully it’s much smoother than the rough old V6 in the Nissan 370Z. You can forgive the lack of low down shove like that from a turbo engine – a Volkswagen Golf GTI feels more punchy – but being naturally aspirated means there’s a nice crisp throttle response and sound isn’t muted. The Hyundai Genesis Coupe can nice and quiet when cruising, but bury the throttle and a sound box amplifies the noise from the engine and pipes it into the cabin. Really the only thing that lets the powertrain down is the gearbox. It’s not terrible, but the longish throw and heavy clutch means stirring the gears isn't as fun as it could be. There is an eight speed automatic gearbox available as an option, though you can’t specify it with the mid-level R-Spec model we tested. That’s because that car is aimed at the enthusiast, and for an extra £2,000 over the entry model it adds comfy yet supportive body hugging sports seats, tuned suspension, Brembo brakes, 19-inch alloy wheels and a limited-slip differential which really helps traction on exiting a corner - or makes it easier to maintain a slide, should you dare to turn the stability control off. It’s a two-stage system, allowing you to disengage the traction control but with a backup ESP system to prevent a full spin. This setting is a happy medium: in the normal setting, the traction control cuts the power for too long should the rear wheels break traction, which is easily done with 348bhp. This can leave you unnervingly floundering when pulling out at a busy junction. One thing that’s really a revelation on the Genesis Coupe is the steering – it’s easily the best of any Hyundai we've ever driven. Its's a good old-fashioned hydraulic system rather than an electric one, and as long as you aren’t expecting the precision and finesse of a Porsche Cayman most people will find the Hyundai Genesis Coupe to be a fine handling car that’s fun to hustle along tight and twisty roads. It’s also surprisingly comfy when you're just cruising - the obtrusive tyre roar on certain surfaces being the only detraction. Another minor issue is the limited visibility. This makes parking particularly troublesome and a lack of sensors or a camera as standard means you’ll only attempt to stop in the largest of spaces – although there are plenty of those in the US.